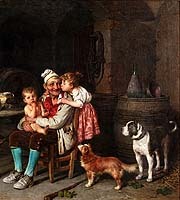 Federico Mazzotta (Italian, 1839-1897) A Very Fine Italian 19th Century Oil on Canvas "Greeting Grandfather", depicting a joyous grandfather enjoying the tender love of his two grandchildren, being kissed by his young granddaughter and his infant grandson who is seated on his lap, while under the watch of a mesmerized and pensive mother, with two dogs at their side, the smallest with a watchful eye aimed at the biscotti peeking out of the old man's pocket, within an ornate giltwood carved frame. 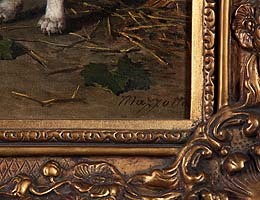 Signed: Mazzotta (Lower right). Circa: 1880. 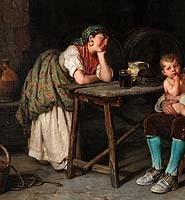 Born in Naples, Mazzotta mainly painted genre scenes. 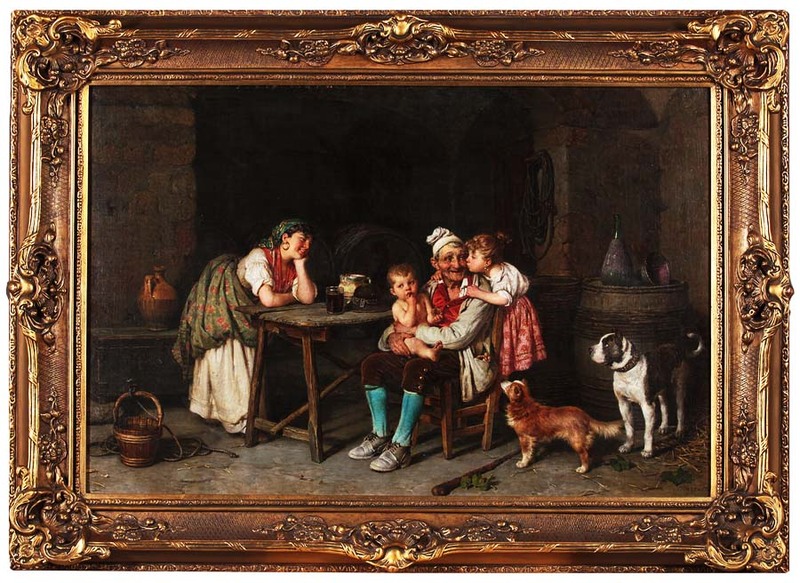 He began exhibiting in 1884 and has several works exhibited in museums such as the Wallraf-Richartz in Cologne and the Walker Art Gallery in Liverpool. 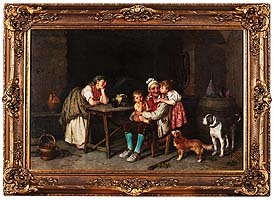 Mazzotta is one amonsgt several celebrated Italian genre painters of the nineteenth century whose works attempt to capture the timeless expression of the happiness of family life. 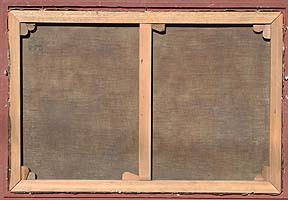 In 1884, at Turin, he exhibited: Un disastro and Un piccolo disastro. In 1886 at Milan, in 1886, he displayed Un trovatello and Il pomo morsicato, and in 1887 at Venice: In campagna. At the 1866 Neapolitan Promotrice, he displayed Margherita Pusterla and her jailer. Ten years later at the exhibitions of Genova and Milano, he displayed a Dionysius, Tyrant of Syracuse. he painted a La tarantella (1873) in Naples, and Il Sandalo (Neo-Pompeian) (1876) for the Promotrice di Genova. 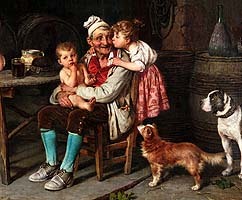 Federico Mazzotta (Italian, 1839-1897) A Very Fine Italian 19th Century Oil on Canvas "Greeting Grandfather", depicting a joyous grandfather enjoying the tender love of his two grandchildren, being kissed by his young granddaughter and his infant grandson who is seated on his lap, while under the watch of a mesmerized and pensive mother, with two dogs at their side, the smallest with a watchful eye aimed at the biscotti peeking out of the old man's pocket, within an ornate giltwood carved frame. 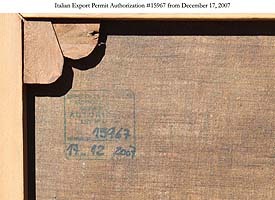 Signed: Mazzotta (Lower right). Circa: 1880. 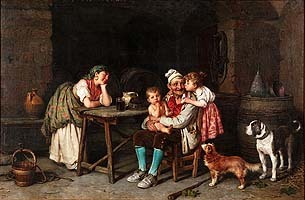 With the grandfather, daughter and grandchildren all sitting around a barn table, a full glass of wine awaits while the obviously happy grandfather enjoys the warm and tender love of his grandchildren, three generations are literally connected in a frozen moment in a family's life. Dizionario degli Artisti Italiani Viventi: pittori, scultori, e Architetti., by Angelo de Gubernatis. Tipe dei Successori Le Monnier, 1889, page 291. Listed in Bénézit, Dictionnaire des peintres, sculpteurs, dessinateurs et graveurs, Gründ 1976, Volume 7, Page 296. Walker Art Gallery Museum, Liverpool, England.